Hi, Coco Schnell here! 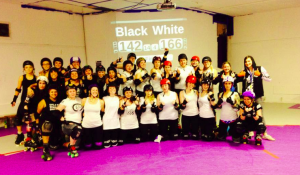 On the 9th of November I finally went to my first Roller Derby bootcamp hosted by Rainy City Roller Girls in their Thunderdome in Oldham and I would like to share my experience with you guys. I was gutted to have missed the opportunity to attend a bootcamp here in Newcastle hosted by Team Wales a few months ago. I passed my minimum skills in June and Rainy’s bootcamp was aimed at the likes of me: passed minimum skills skaters with less than three bouts experience. I skated in a Cherry Popper bout in July and was ready to work on my skills. After a couple of hours of driving from Newcastle, me and my fellow NRG bootcamper Hogwarts Distress had reached our destination: the Thunderdome in Oldham, home of Rainy City Roller Girls. As we walked in we filled out the waivers and were admittedly a bit nervous. What is the skill level of the other participants going to be like? Can I cope with a new floor quickly enough? Will I last six hours?! Before the 11.30am start, we had some time to get our skates on and get used to the floor, then it was time for the off skates warm up. After that, 30 bootcampers quickly put their skates on to be ready for action. 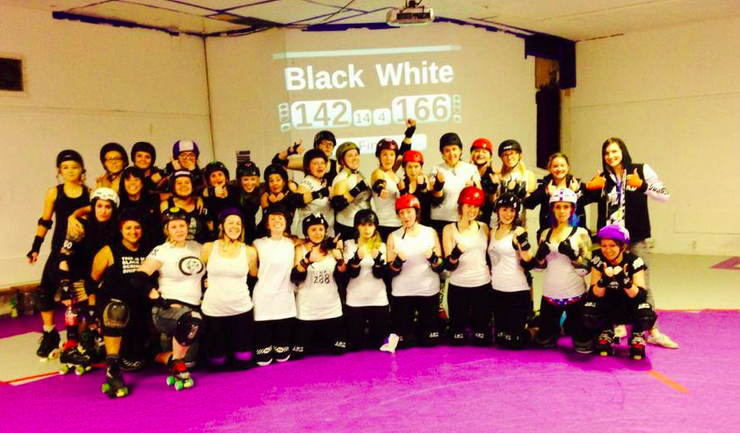 In the following hours we were going to learn about speed control, agility and footwork, blocking positions, pack work and walls, containing somebody on track, offensive techniques, as well as current Roller Derby strategy. Team England’s Fay Roberts covered skills, Faye-tal Blonde was responsible for jamming drills, Liz is How We Wo It covered blocking and Vivien Leighthal taught us about strategy and how to apply it. One of the drills that we practiced was a lateral to edge stop that I knew from NRG practices, but I clearly have neglected practicing that, which is rather silly of me, as it is so important to be able to do this! It gives you more agility and lets you follow your direct opponents’ moves without wasting too much energy for example, as you would do if you were jumping from side to side across the track. Half way through we had a lunch break and surprisingly I didn’t even feel like I needed a break yet, as I’d had so much fun. I was tricked by my mind, because after the break, back on track, I did feel a little tired. But that tiredness was soon washed away quickly and replaced with motivation to work on my skills! There was two more hours of helpful drills, followed by a scrim, Team Black vs Team White, for the last hour. Rainy City had kindly organised for Refs and NSOs to be there to give us the opportunity to put our newly acquired skills to the test in a bout scenario. My team, Team Black, was defeated by Team White by 24 points. Oh well, close call! In summary I feel like I have learned a lot and am very happy to have attended, will definitely go to another bootcamp any time and can strongly recommended it to any skater, no matter which level. It was great to meet skaters from other leagues and a big thank you to everyone involved in organising this, especially to our four teachers Fay, Liz, Faye and Vivien! You were super helpful and couldn’t have been lovelier! I really enjoyed it and cannot wait to see the ladies in action on track when they are going to play our very own Canny Belters in the Northern Series Final in Newcastle on the 29th November. 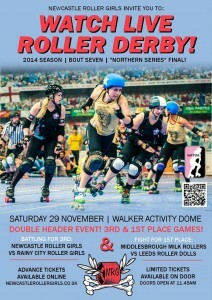 Buy tickets for the Northern Series Final here.